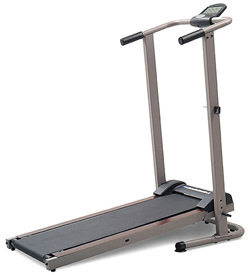 The Weslo Cardio Stride Plus treadmill is a cheap machine manufactured by Icon Fitness who otherwise engineer and produce excellent treadmills in their other brands, such as Nordic Track, Reebok and Image. But the Weslo line is the lowest-priced. The Weslo Cardio Stride Plus is one of those rare-breeds of non-motorized treadmills, where your own striding momentum is used to advance the moving belt. It offers about the same level of exercise as walking to the end of your driveway and back. UPDATE: The CardioStride Plus is no longer available. Check out the full lineup of Weslo treadmills at reduced prices here. We would like to start off by listing all the positives of the Weslo Cardio Stride Plus but all you’d hear is the sound of crickets chirping. 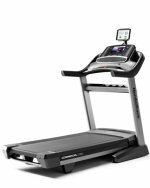 You may have found great prices at K-Mart and Wal-Mart for the Weslo Cardio Stride Plus but this treadmill is not a good buy at any price. Not even free. It offers poor quality, cheap parts, and it’s an eyesore in your family room besides. We can’t even find what the maximum recommended weight of the user should be. The Weslo Cardio Stride Plus is strictly for pretense and not for working out — at least not for an adult. If you don’t realize how narrow a 13" belt is, get out a ruler and hold it up to your shoulders. Think of a woman’s body (let’s use an ideal 36-24-36) and then image yourself on this tiny treadmill. Maybe your 60-pound, 8-year-old could work out on this thing, but he’d probably get quickly bored and be turned off to exercise forever. Haven’t we said enough already? The Weslo Cardio Stride Plus treadmill is an embarrassment to the treadmill market. How Icon Fitness manages to sell these things is a mystery but they must have some top people working in marketing if they can get you to believe the sales pitch. We’ve yet to see a treadmill for under $400 that’s worth a darn. About the only thing we can recommend is the Weslo 50SE, which is twice as expensive but at least those Weslo treadmills look and feel like real machines.